Taking 580,000 cars and trucks off the road would reduce a lot of greenhouse gas emissions. And something like that would happen if a proposal by the U.S. Environmental Protection Agency becomes reality, according to a new analysis released by EWG. Last November, the EPA put on the table a proposal to reduce by 1.39 billion gallons the amount of corn ethanol required to be blended into gasoline to produce vehicle fuel. But the agency has not made a final decision. That is expected to come at the end of June. In the meantime, it is under intense pressure from corn farmers and corn ethanol refiners to reverse course and maintain the so-called “ethanol mandate” at the current level, which is 14.4 billion gallons this year. When it comes to fixing the nation’s broken biofuels policies, nothing is ever easy. When Congress enacted the Energy Independence and Security Act of 2007 and established the ethanol mandate, its goals were laudable: the nation would shift away from fossil fuels, some of them imported, to renewable energy sources. Ethanol production was seen as a path to American energy independence and enhanced national security. Few legislators anticipated that the mandate would eventually divert 40 percent of the nation’s corn crop from feed and food to fuel and would drive up the price of corn. Nor did lawmakers foresee that farmers would respond to those high prices by plowing up millions of acres of wetlands and grassland, releasing carbon stored in the soil and increasing emissions of nitrous oxide, a product of fertilizer application that is also a potent greenhouse gas. But both unintended consequences have become reality. Between 2008 and 2011, American farmers converted 23 million acres of wetlands and grasslands – an area the size of Indiana – to crop production. 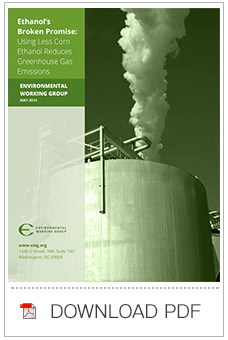 EWG’s analysis estimates that this massive transformation in the way the land is being used has resulted in greenhouse gas emissions of between 85 million and 236 million metric tons a year more than previous years. It turns out that corn ethanol has actually accelerated global warming more than gasoline. Recent research by the EPA has estimated that ethanol production increases greenhouse gas emissions by 33 percent, compared to gasoline. Now the agency is poised to make a much-needed course correction. Its proposal last November to reduce the corn ethanol mandate to 13.01 billion gallons could have a significant and immediate benefit to the climate. Not surprisingly, the corn ethanol industry is furiously opposing EPA’s proposal. The decision is now somewhere in the bowels of the EPA. At some point, the agency will issue a final determination and send it to the White House Office of Management and Budget for review. It is impossible to say how long OMB will deliberate. The test will come when the President must face down ethanol refiners and Big Corn. Will he act and allow EPA to act, reducing the amount of corn ethanol blended into gasoline? Or will he blink and revert to the old, unsustainable status quo?